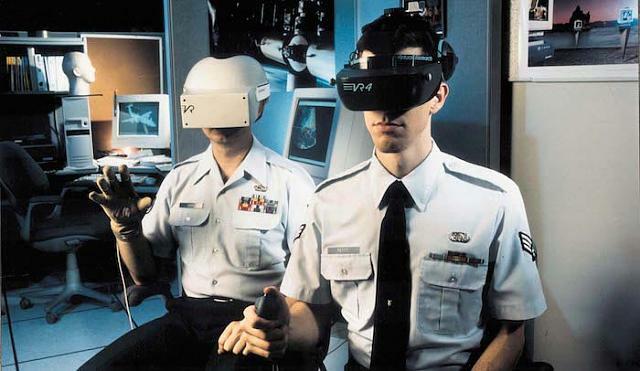 The air force use virtual reality as part of their training systems. The most well known use if flight simulators which are designed to teach flying skills but within a safe environment. But virtual reality is also used to treat sufferers of Post Traumatic Stress Disorder (PTSD) who have recently returned from a combat zone and are experiencing various symptoms associated with this. 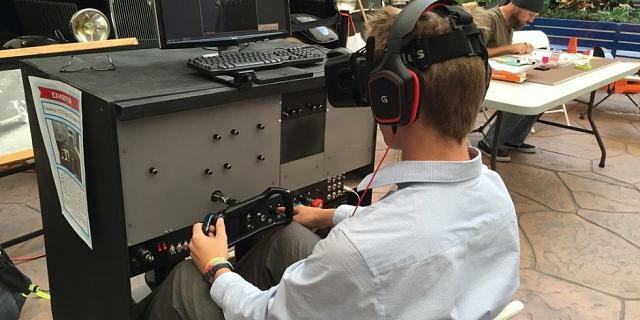 The flight simulator is a form of technology most people are familiar with. 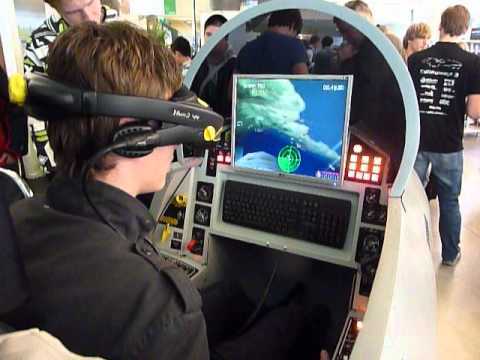 It contains a cockpit and controls which are seen in real world aircraft and replicates the movements associated with flying. The pilot controls the simulator by using a joystick which has force feedback thereby allowing him/her to experience how it responds when he/she moves this joystick. The flight simulator is an enclosed unit based on a motion platform which has 6 degrees of movement and responds to changes in weather, turbulence and battlefield conditions. It is mainly used to train pilots but is also used as part of aircraft research and development (R & D). These devices are used to train military pilots for combat missions which includes co-ordination with ground operations, emergency evacuation, e.g. medical and flying whilst under fire. The aim is for the pilot to experience a sense of immersion and to feel as if they flying a real aircraft with real controls and under real life conditions. This means that the simulator must contain the same set up as seen in an actual aircraft, e.g. helicopter and move in a realistic way. If not then the training session breaks down as the pilot suddenly becomes aware that the movements of the simulator are inconsistent with their mental model. This is why it is important that the simulator is programmed in such a way that it mimics the movements of a real aircraft via force feedback which enhances the pilots experience. and I'm pretty sure we are just watching at the top of the iceberg, the main technology should be hidden from the public and the "enemy" and should be truly amazing and realistic. Now that VR is finally a reality what should our expectations be?